Mix-n-match for the perfect holiday snack pack! 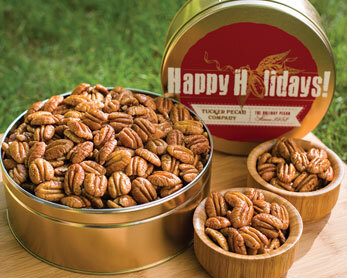 Fill your TUCKER PECAN COMPANY Holiday Candy Gift Tins with your favorite flavors. 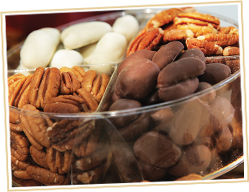 Sample fresh pecan halves right from the shell or cover your pecans with any of TUCKER PECAN COMPANY’s delicious flavor combinations. All pecan combinations are packed for freshness in our classic holiday gift tins. Select your own combinations for the perfect Holiday treat! Chocolates shipped October through May only.